This may seem premature, but I’m taking all the spoiler precautions I can. So, if you haven’t seen the revival, don’t read any further because SPOILER ALERT. Overall, Gilmore Girls: A Year in the Life was a charming check-in with the little town in Connecticut we all know and love — and hadn’t seen since 2007. While the Netflix revival was full of fun pop culture references and shout-outs to characters who weren’t seen in the revival or didn’t get much screen time (I’m looking at you Sookie), it was nice to see our beloved characters move on in life. Yet, while there was definitely a lot to love in Gilmore Girls: A Year in the Life, the episode “Summer” featured a body-shaming scene that was pretty disappointing. 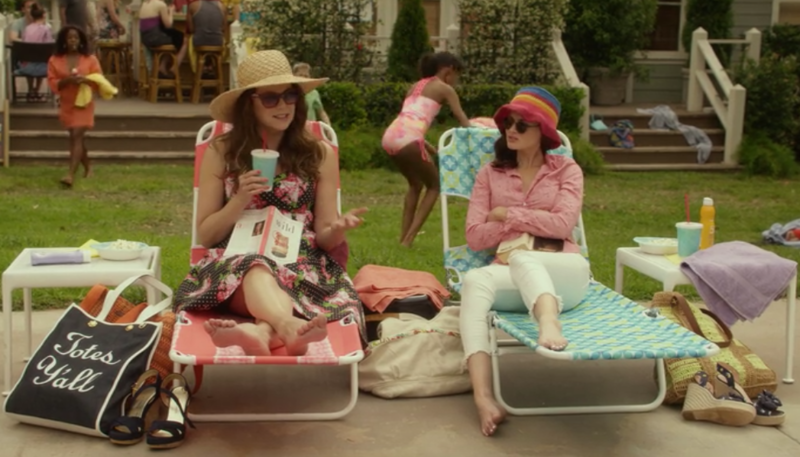 “Summer” opens with Lorelai and Rory Gilmore spending time at the Stars Hollow community pool. Right off the bat, two overweight men walk by, only to be quietly mocked by the Gilmore girls, who say “belly alert” as the men walk past. The line is quick and uncomfortable, but is rushed past as Stars Hollow resident Andrew comes over to welcome Rory back to Stars Hollow, a recurring element of the episode. Despite her continuous claims that she is not “back” and is just visiting, Rory isn’t fooling anybody and it seems the residents of Stars Hollow are actually excited to see her. We learn roughly two minutes after “belly alert” that the body-shaming moment before wasn’t a one-off, as a Stars Hollow resident — nicknamed “Back Fat Pat” by Rory — approaches the duo to kindly welcome Rory back to Stars Hollow. Making it even worse, Rory thanks him by accidentally calling him fat, TO HIS FACE. This is widely inappropriate for so many reasons, but it’s also disappointing that Amy Sherman-Palladino and Dan Palladino see this as something viewers will find funny. Sure, Lorelai and Rory Gilmore aren’t supposed to be perfect characters, but this scene wasn’t meant to show off their flaws. It was meant to be a funny moment in which Rory calls someone fat to his face — which is definitely not funny or Stars-Hollow-charming. This is especially troubling considering Lorelai and Rory’s love of food. In fact, in the very first trailer for the revival, these two women are seen discussing the fact that they ordered Chinese food, Greek food, Italian food, and hot dogs the night before, all while munching on some Pop-Tarts at the dining room table. In other words, us viewers are led to believe that it’s cool to eat unhealthy amounts of food – but it’s not cool to gain weight from it? This isn’t the first instance of offensive or inappropriate comments on the show, either (Emily Gilmore’s weird dynamics with her housekeeper), but the fact that offensive comments and storylines made it into the revival is disappointing. In fact, it seems that when writing the show, ASP and Dan didn’t take into account that the viewers had grown in the 10-year absence of Gilmore Girls. This doesn’t mean that the body-shaming scene wouldn’t have been offensive or weird in 2007, it just means that the characters haven’t progressed in the 10-year absence like the viewers have. Most teens or preteens who watched the show during the initial run have grown to become more conscious adults. Unfortunately, we can’t say the same about our beloved Gilmore girls. You can love the show or feel optimistic about the revival, but you can also still be frustrated with some of the comments made during the reboot. Ultimately, with this in mind, we hope that if ASP and Dan *do* decide to make more episodes, they’ll think a little bit more about their audience before throwing in cheap, demeaning jokes.